There's only one set of outcomes in next weekend's games that would leave the Vikings with nothing at stake for their regular-season ending game with the Bears. 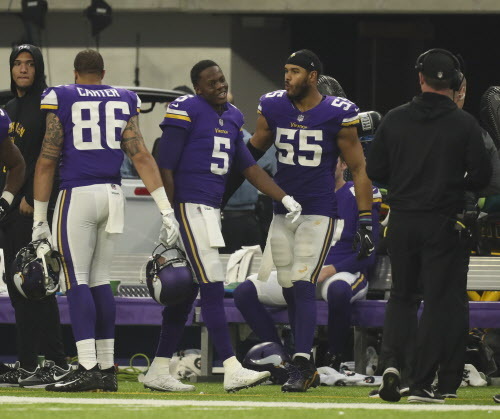 Vikings quarterback Teddy Bridgewater (5) smiled at Vikings head coach Mike Zimmer, right, as he returned to the Vikings bench after playing a fourth quarter series that ended with him throwing an interception on his first pass attempt. Jeff Wheeler photo. As the Vikings cruised to their 11th win of the season Sunday, clinching their second NFC North title in three years with a 34-7 win over the Cincinnati Bengals, Case Keenum turned in another quietly efficient performance in what’s become perhaps the most impressive season by a Vikings quarterback since Brett Favre in 2009. That distinction, of course, includes Teddy Bridgewater, who led the Vikings to the 2015 NFC North title and returned to game action on Sunday for the first time since his catastrophic knee injury once the Vikings built a big enough lead to take Keenum out. Keenum, who completed 20 of his 23 passes for 236 yards and a pair of touchdowns on Sunday, has now completed 67.9 percent of his passes for 3,219 yards and 20 touchdowns against seven interceptions this year. Keenum figures to remain at quarterback on Saturday at Lambeau Field, as the Vikings pursue their 12th win and a better chance at a first-round bye. They can only land the NFC’s top seed if they win their final two games against the Packers and Bears, while the Eagles lose their last two against the Raiders and Cowboys. They’d be no worse than the No. 2 seed, though, with one win and one Panthers loss. Essentially, the only way the Vikings would have nothing at stake in their final game of the season would be if they won in Green Bay on Saturday, the Panthers lost to the Buccaneers on Sunday and the Eagles beat the Raiders next Monday night. That scenario would lock the Vikings into the No. 2 seed before Week 17 against the Bears, and it might lead them to give Bridgewater the start while resting Keenum. The arrangement would allow the Vikings to get a better look at Bridgewater — either in the event they needed him in the playoffs or the possibility he regains their starting job in the future — and it would help them keep Keenum healthy, though coach Mike Zimmer might also be wary of sacrificing momentum in the name of resting too many players. If the Vikings still need a victory to improve their seeding in Week 17, it’d seem likely they’d stick with Keenum for that game, and possibly turn to Bridgewater if and when a victory was in hand. As emotional a moment as the quarterback’s return was on Sunday, the Vikings are now late enough in the season that they’ll likely ride with Keenum the rest of the way and figure out the long-term quarterback situation later. The Vikings’ success with Keenum, and the stakes for which they’re now playing, effectively restrict them from doing anything else.